Three drivers - Sebastian Vettel, Daniel Ricciardo and Lewis Hamilton - each had two wins in the first six races of the 2018 season. Somebody had to break the tie in the Canadian Grand Prix. And Vettel did it in convincing fashion as he led all the way to win for the third time this year. Here's how his victory unfolded. While overtaking in Montreal is nowhere near as difficult as it is in Monaco, the best spot to go for the win is still pole position. And that is where Vettel planted his Ferrari on Saturday afternoon. The usual suspects rounded out the top six on the grid: Valtteri Bottas (Mercedes), Max Verstappen (Red Bull), Hamilton (Mercedes), Kimi Raikkonen (Ferrari) and Ricciardo (Red Bull). Vettel shot into the lead at the start of the 70-lap race and stayed there for the rest of the afternoon. Bottas fended off Verstappen to get second place, and he held on to it for the rest of the race. "Since lap one really, they (Ferrari and Vettel) seemed to be a bit quicker all the time," Bottas said, "and they could control the race and were really pushing on it and we got into a little bit of trouble in the end, running out of fuel; that's why Max (Verstappen) got close in the end." The same thing held for Verstappen - third all the way - except for during the pit stop sequences when Raikkonen claimed the spot. "We had to pit early, because the hyper softs were pretty much gone," Verstappen said. "But then we had a really good pace on the super softs, so I was steadily closing the gap (on Bottas) and especially the last few laps I think we were really competitive. A good race. I enjoyed it." Both Vettel and Bottas managed to make their ultra soft Pirelli slicks last more than half the race. Then they pitted, each without losing their positions, for the super soft compound. Staying out so long ensured a comfortable one-stop race for both of them. "During the first stint I tried to build up a little bit of a cushion," Vettel said. "I had one lock-up where I lost a bit of time but after that I think it was fairly well managed. It wasn't easy with the traffic and so on. In the end I was just praying that we don't run into a problem, which can happen, so I tried to save the car a little bit, stay away from the curbs and just bring it home." Ricciardo has won twice this year, but he was only fourth in Canada and not a contender for the victory. "Pretty good actually," he said of his race. "I'm relatively content for a fourth place. I think we chose to qualify on the hyper soft, we knew it would be aggressive at the beginning but we knew we had to use that. So we got the jump on Kimi (Raikkonen at the start) and then the overcut on Lewis (Hamilton during the pit stops) so I actually think we did all we could with that strategy." Hamilton has won twice this year, but he was only fifth in Canada and not a contender for the victory. "It was a tough day in the office today," he said, "but I'm just very grateful that I finished today's race and score some points. From the start I was down on power and my engine was overheating. I couldn't get the temperatures down, so I just thought it was going to fail. Every single lap I was waiting for the power to just drop away and disappear - but it kept going. I could have lost a lot more points today; fifth is not the strongest result, but it could have been a lot worse. Ferrari have been doing a slightly better job and brought a better package, but we are very close." "There was a little bit of confusion, because they waved the checkered flag one lap too early," Vettel said. "That was funny, because on the steering wheel I have the lap count. I have the pit board as well and it showed one more lap to go. I even watched on TV after I saw the checkered flag and it said final lap. I was a bit confused, but then I told them 'I think the race isn't over yet' and they said 'no, no. no, keep pushing.' Some of the marshals were already celebrating." A celebrity guest flag waver had mistakenly started waving the flag during lap 69 rather than the end of lap 70. Fortunately, no fans rushed onto the track a lap too early and before the race was run. In cases like this, the regulations state that the final race results revert by one lap. Thus the race was classified to be 68 laps rather than 70. That did not, however, change the final race finishing order. Vettel now has 50 Formula 1 wins. It was also the 231st victory for Scuderia Ferrari. 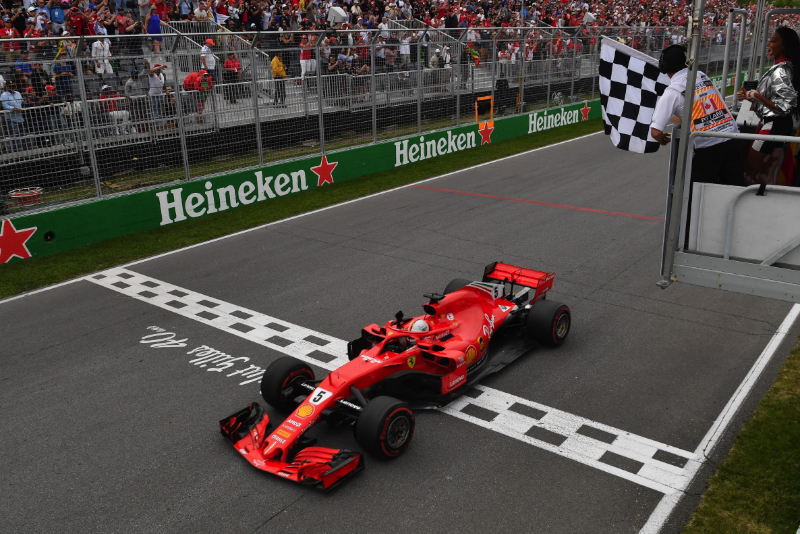 Vettel predicted the Canadian and Ferrari fans would be having a great party that night. "Perfect is probably a good way to describe it," he said of his victory. "Unbelievable. I said yesterday how much this place means for Ferrari. We see it from the moment we touch down and come here and to have a race like we had today is unbelievable. Okay, 50 for me, but I think after a long time, a long stretch that Ferrari didn't win here, I saw the people around and they were super happy. I'm sure they had a blast and they will have a blast tonight.